The story goes that one day the legendary Diana Vreeland, fashion editor of Harper's Bazaar for years and editor-in-chief of Vogue, asked a stewardess on her flight for Apple Brown Betty. The horrified stewardess politely replied, "Oh! I'm afraid that we do not have Apple Brown Betty, Ms. Vreeland." 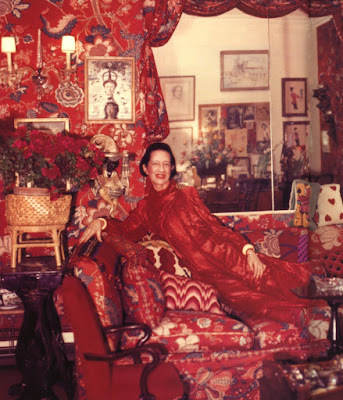 Vreeland then threw up her red-lacquered nails, triumphantly exclaimed, "Fake it!" and more than likely dismissed the shaken girl back to her post. It's as good a credo as any, and certainly one to which I have often subscribed. Just the other day, I was rooting around the refrigerator for something to make for dinner when I spied an excess 1/2 pound of wrapped, fresh ground pork sausage that we hadn't needed for our Chinese dumplings (but that's perhaps another post). I immediately thought of little pork meatballs for an Italian Wedding Soup but according to the recipe I found, I was shy on some of the ingredients. I had all the stuff for the meatballs, but I didn't have any carrots. However, I did have a cube of vegetable broth that went in with my cubes of chicken broth for the base. I didn't have escarole or arugula, but bursting sprigs of parsley added the lovely, familiar green touch as well as flavor. Orzo? No. But I had a box of Uncle Ben's rice. I would have liked to have shaved a nice piece of Parmesan on it but we sprinkled a plastic cup of grated Parmesan from a recent take-out order instead. So, there you are. 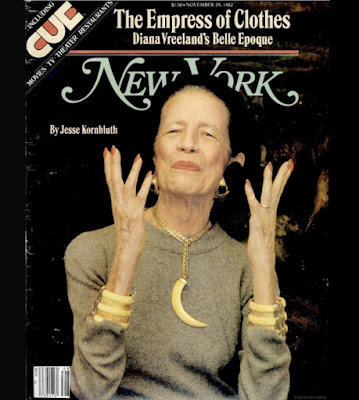 Diana Vreeland's Wedding Soup! Delicious! As I have maintained in the past, a stroke of ingenuity is as necessary as any pot or pan in the kitchen. So, the next time you're stumped there, or anywhere really, just remember the words of the outrageous, great lady Vreeland and do your damnedest.